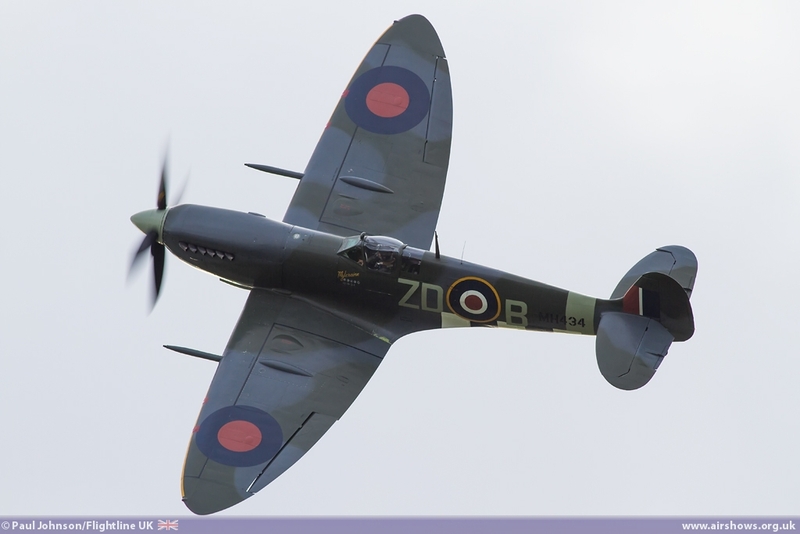 Biggin Hill is perhaps one of the most famous airfields in the UK thanks to the station's important role in the Battle of Britain. 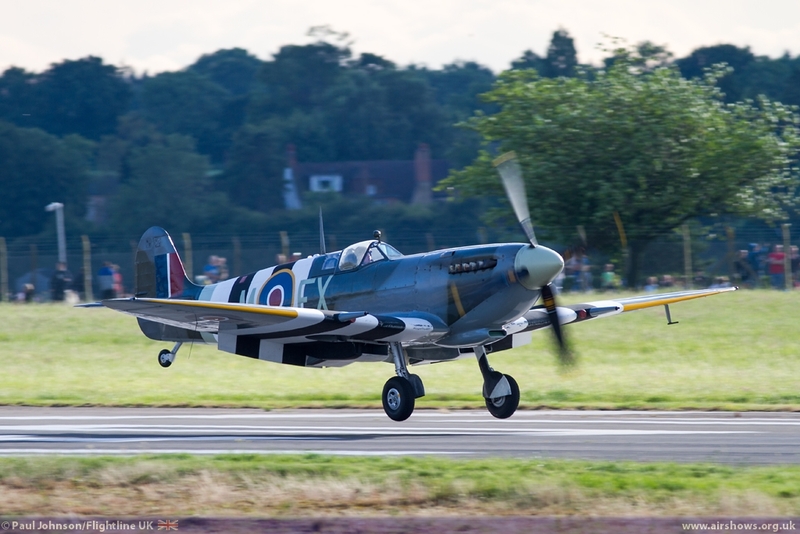 In more recent years however, it was best known as an airshow venue hosting Battle of Britain Open Days and the incredible International Air Fair. 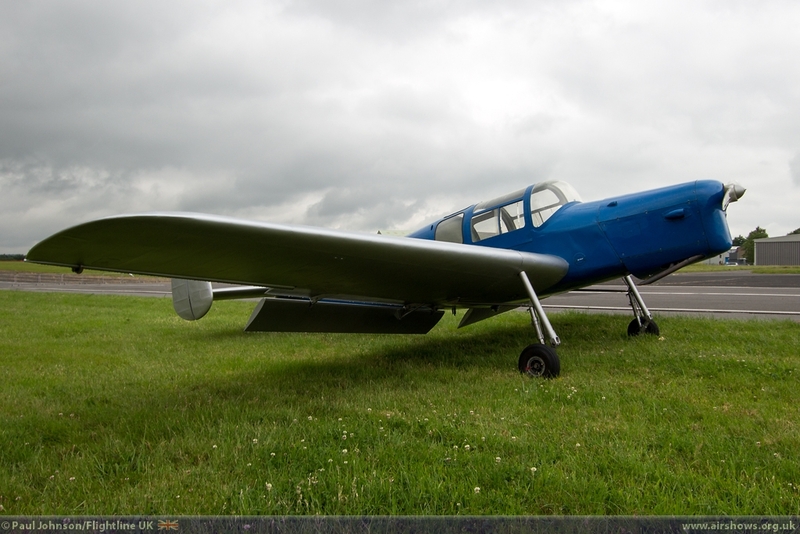 However, that came to an end in 2010 as the airport management at the time chose to focus on its business aviation role. 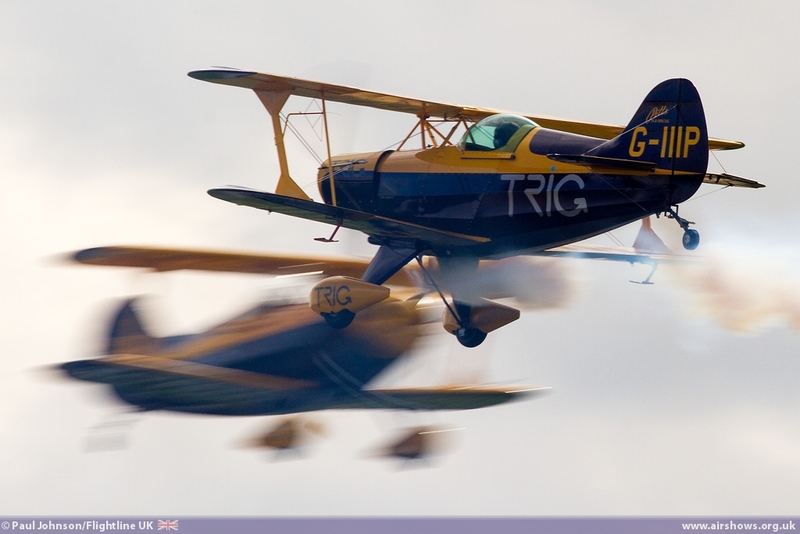 While 2011 saw a small community event with a minor flying display, 2014 truly marked the return of airshows to Biggin Hill with the Festival of Flight. 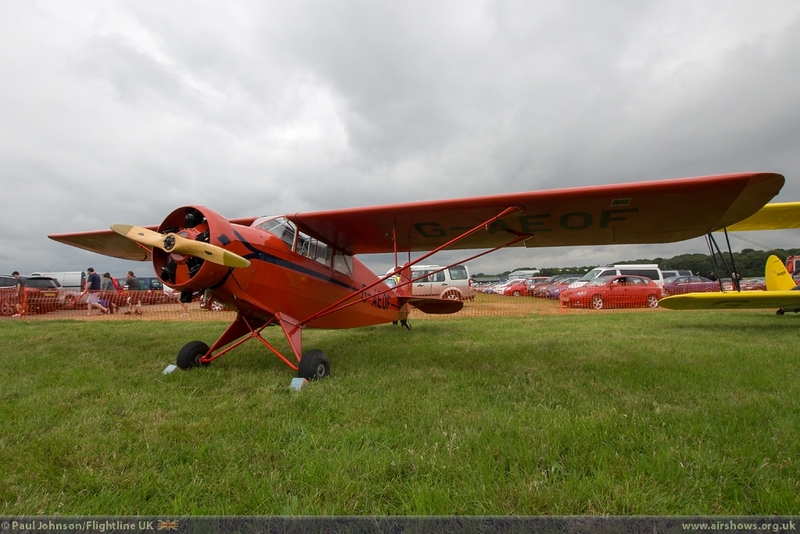 Paul Johnson/Flightline UK reports from the inaugural event. 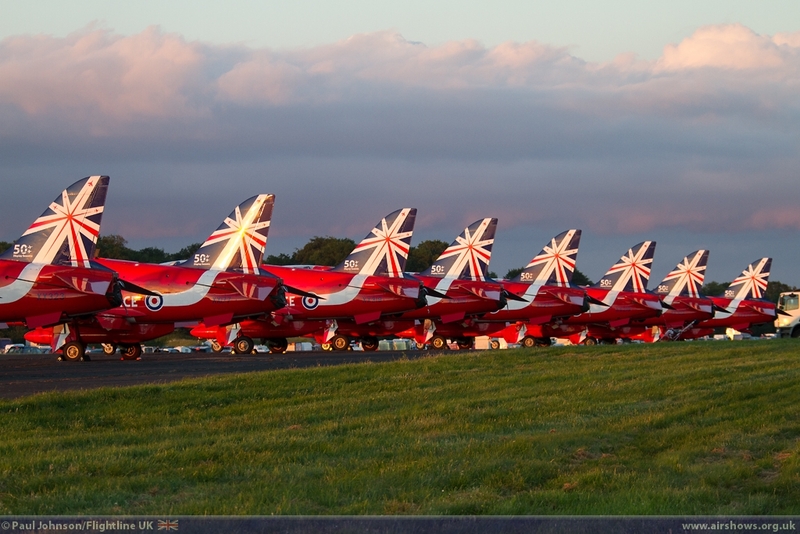 Photography by Paul Johnson/Flightline UK and James George. 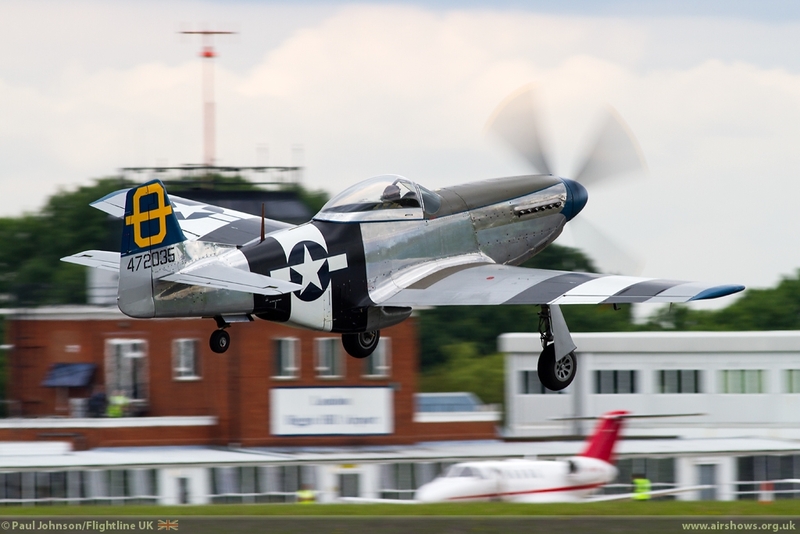 The Biggin Hill Festival of Flight is a brand new event and concept. 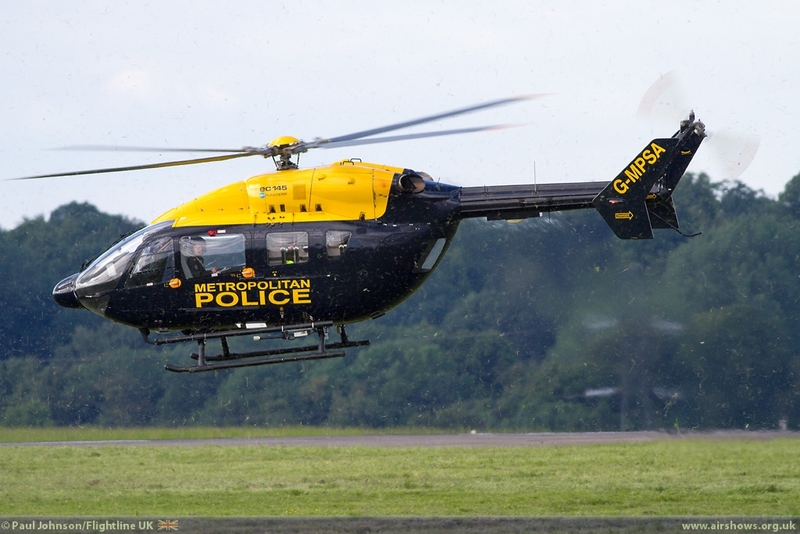 From the outset, the event was squarely aimed on the local community that lives around the airport. 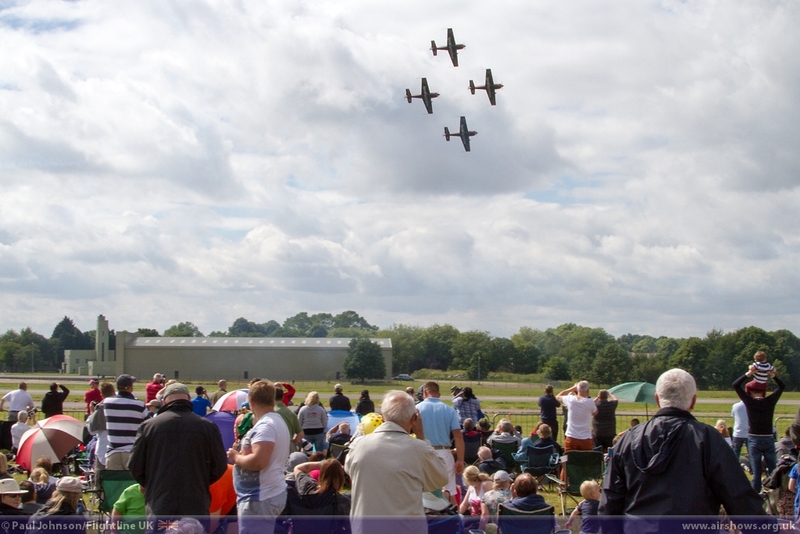 Local residents benefited from discounted tickets and overall, the attendance was capped to 15,000. 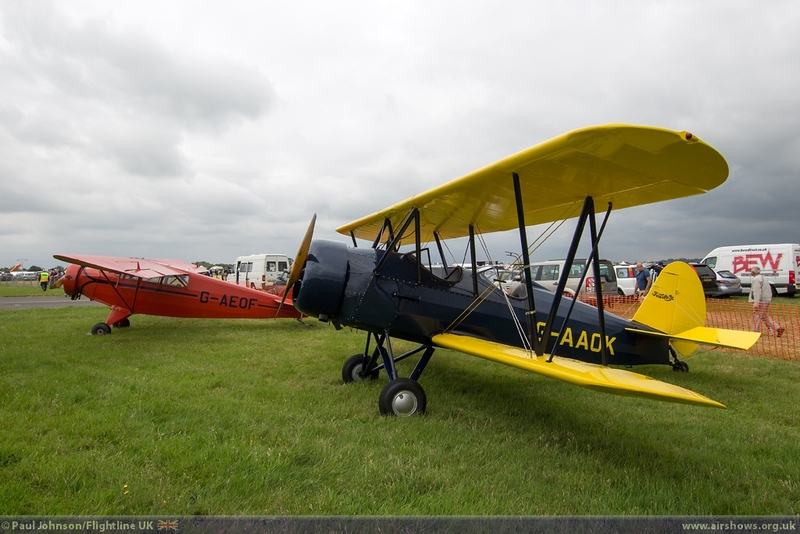 While this was not the old Air Fair, it was organised by Colin Hitchins and many of the old team who put together the latter International Air Fair events plus the aviation themed concerts at Chartwell, Loseley House and RAFC Cranwell. 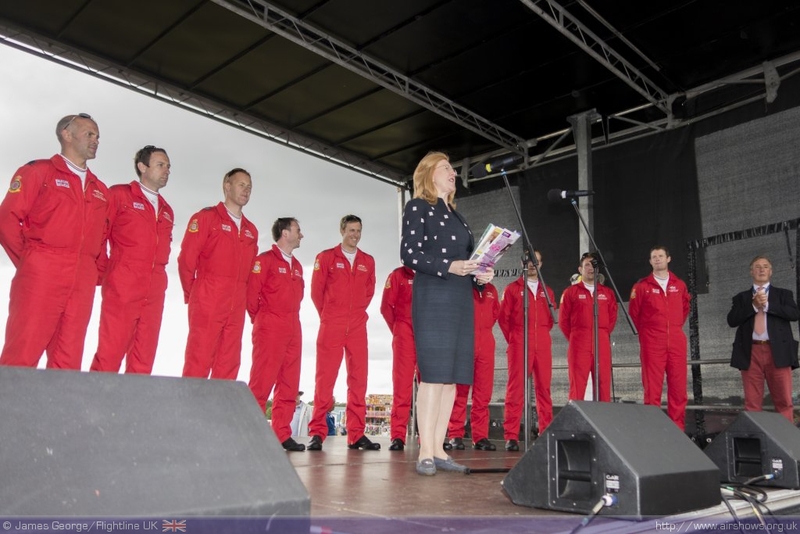 It was good to see the Airport management getting behind the event too with the current managing director Will Curtis addressing the crowd to during the afternoon. 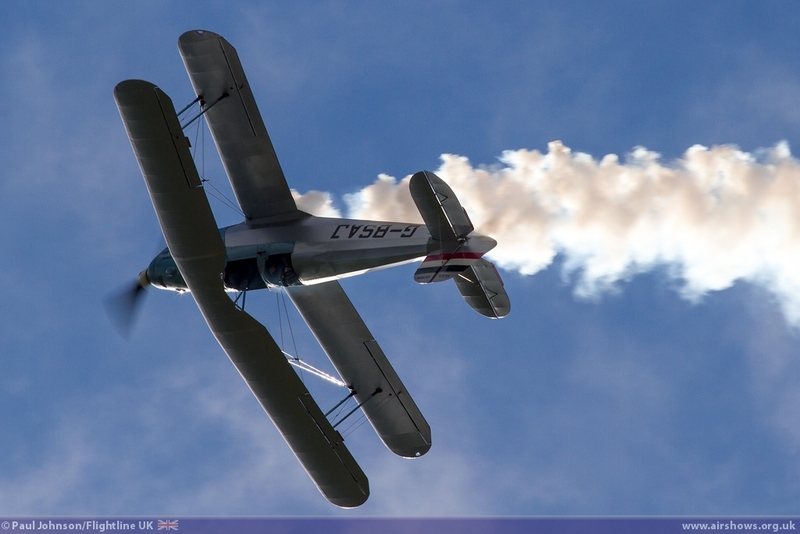 Will was also reintroduced to his Sukhoi, albeit in model form during the day. 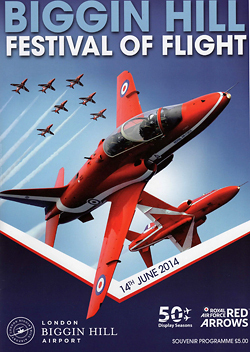 The “Festival” part of the title also signalled a change of event style. 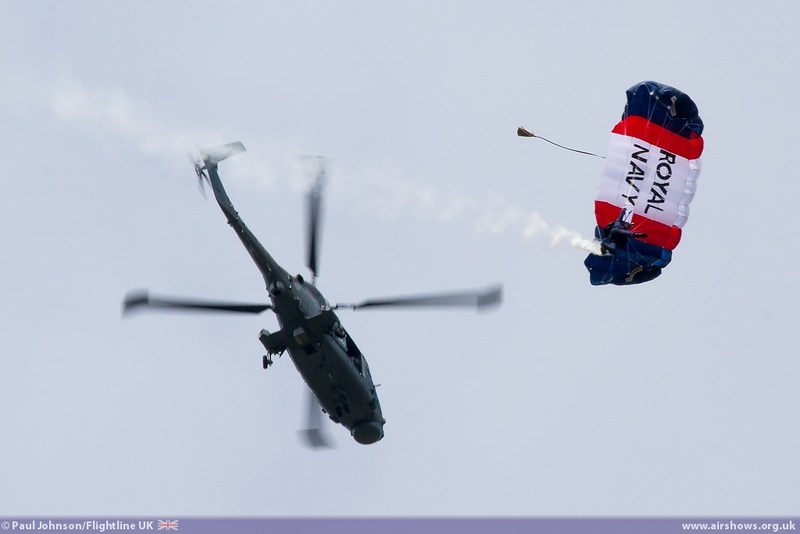 The whole event did not open until noon and ran until 8pm in the evening. 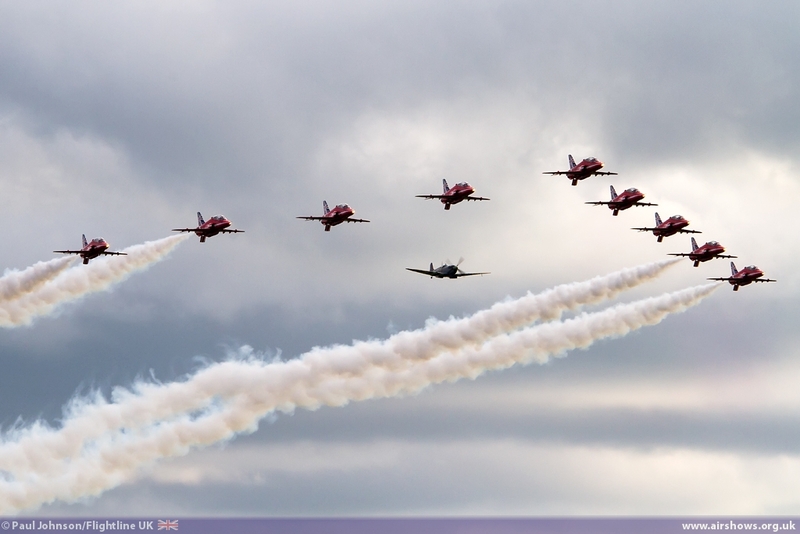 The Flying Display was divided into three different slots spread over the afternoon and early evening, each just over an hour long. 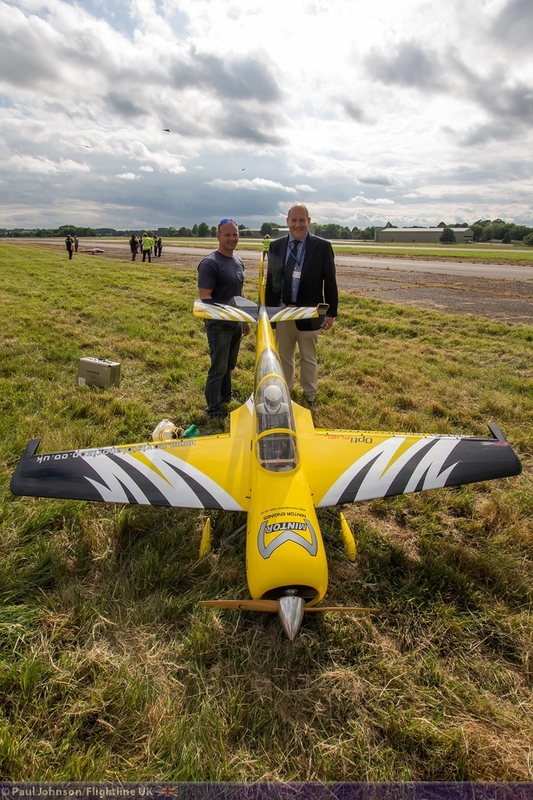 In the non-flying gaps there were other activities centred on a stage and arena plus radio controlled model flying. 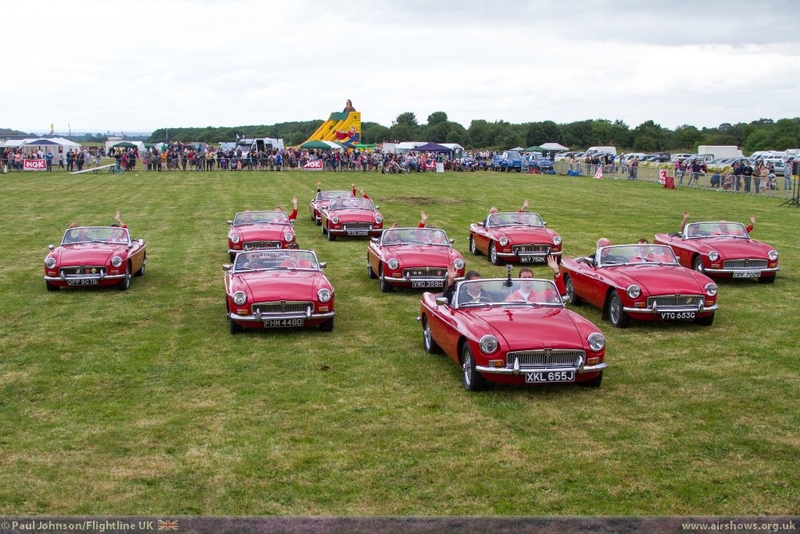 Around the showground there were a traditional Fun Fair and a large model exhibition including cars and boats. 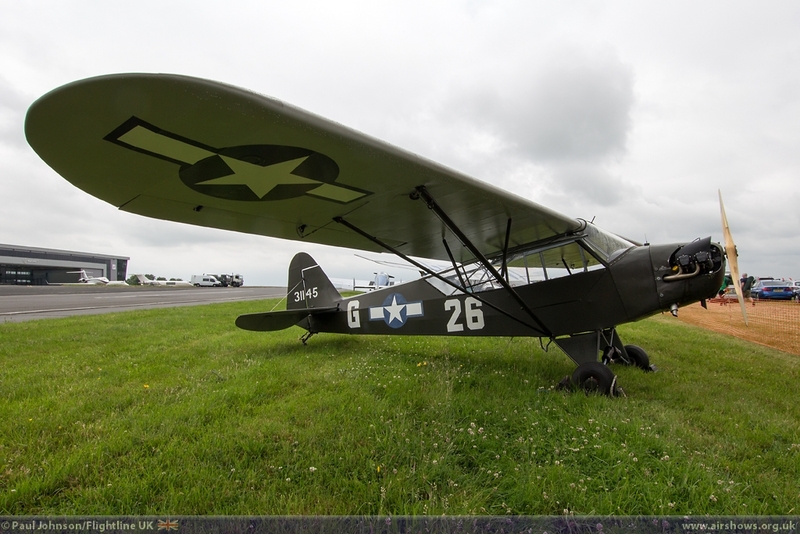 There was also a static display of historic air transports and sporting aircraft which included the Miles Messenger, de Havilland Dragonfly, Travelair, Piper L4 Cub and Rearwin Sportster. 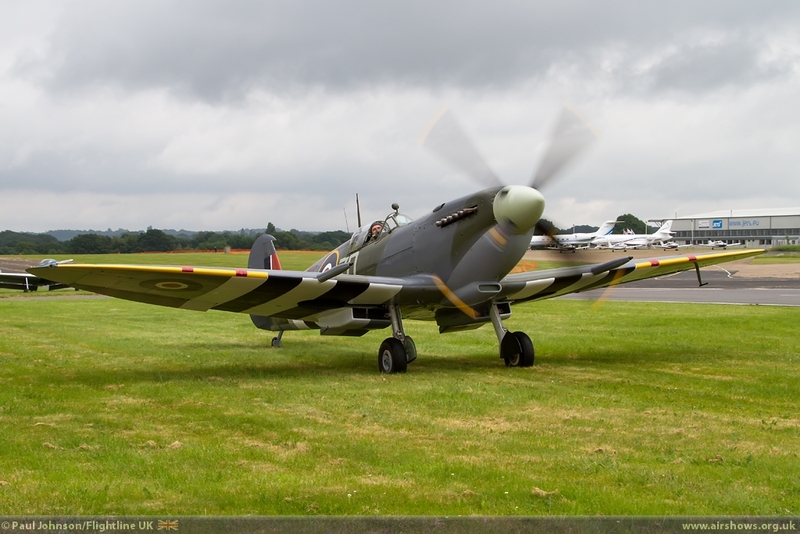 Visitors also had the chance to sit in the cockpit of one of the Biggin Hill Heritage Hangars Supermarine Spitfire IXs. 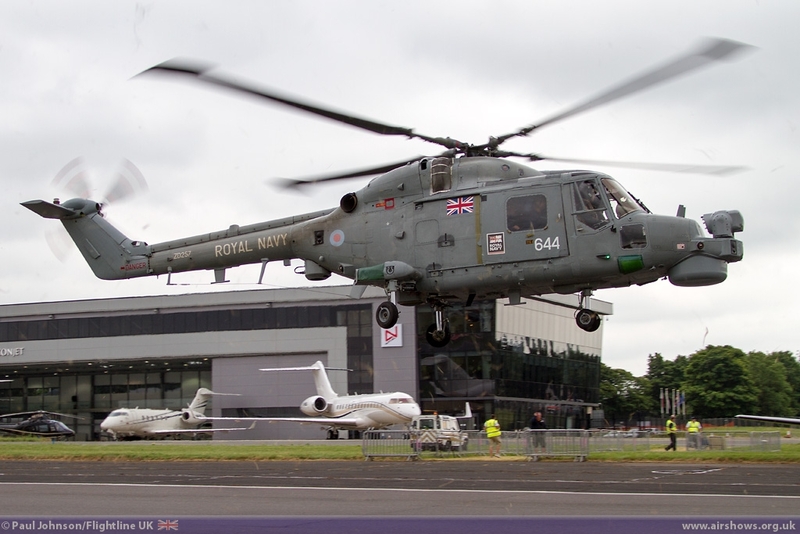 The High point of these “ground” activities certainly was aviation related. 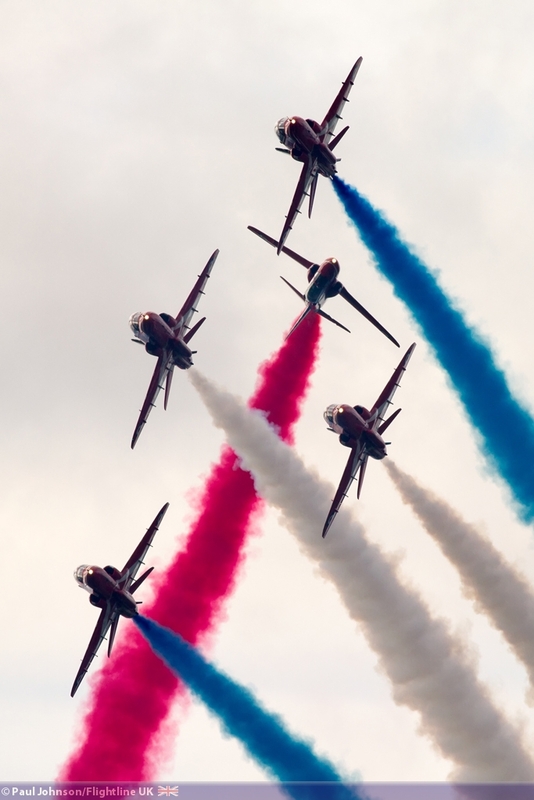 2014 sees the Royal Air Force Aerobatic Team, the Red Arrows celebrate their 50th Display Season. 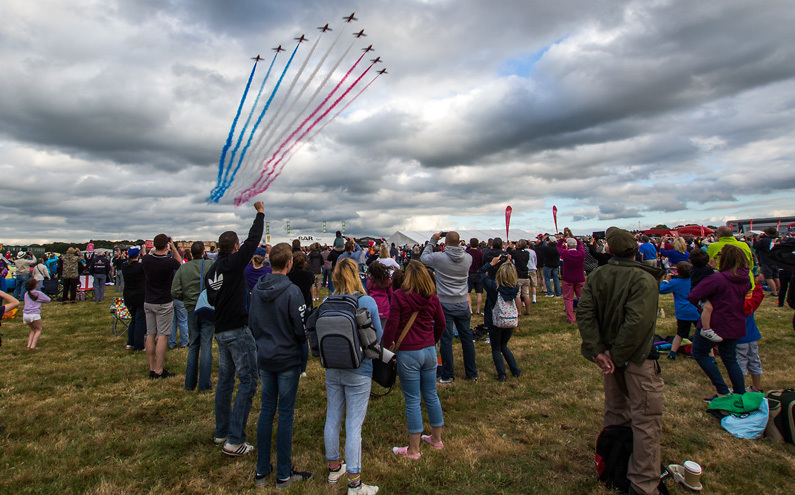 The team completed their first PUBLIC UK display at the Biggin Hill International Air Fair and the returned as the star act of the Festival of Flight. 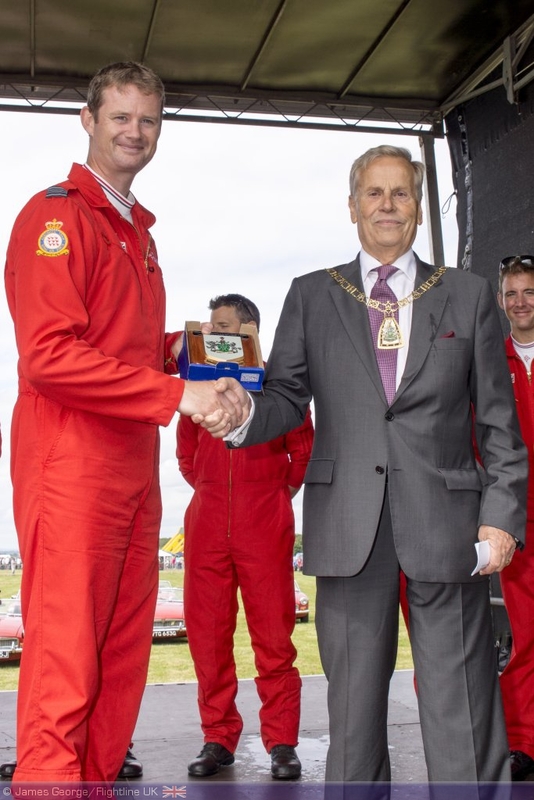 Mid-afternoon saw the team make their way to the stage in 10 bright red MG sports cars to be introduced to the crowds and receive some special presentations from local dignitaries from the Borough of Bromley. 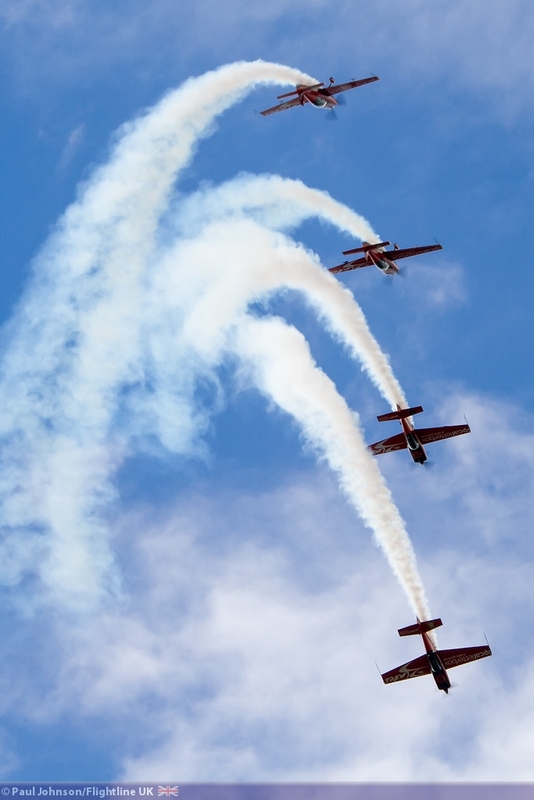 The flying displays were certainly varied and entertaining bringing together some parachutists, modern military aviation, historic warbirds and civilian aerobatic displays. 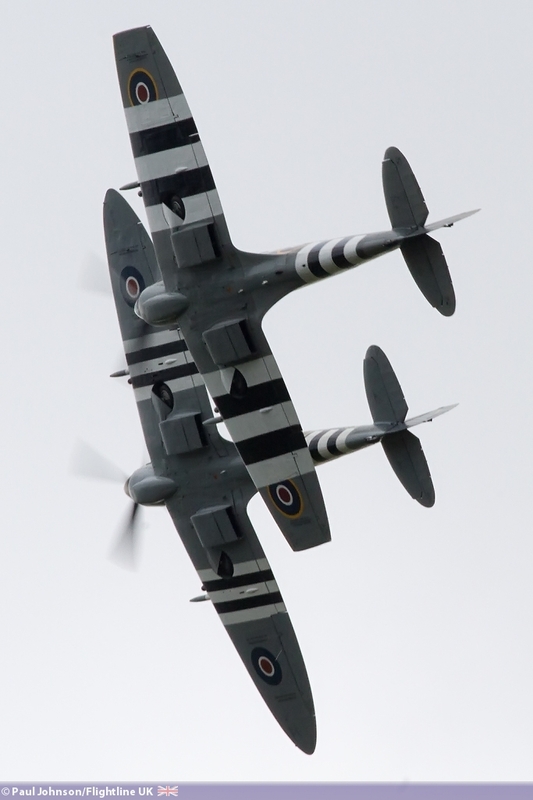 It was also good to see and hear commentators Andy Pawsey and Brendan O'Brien back at Biggin Hill – their mix of light heartened humour and facts certainly matched the fun and entertaining spirit of the event. 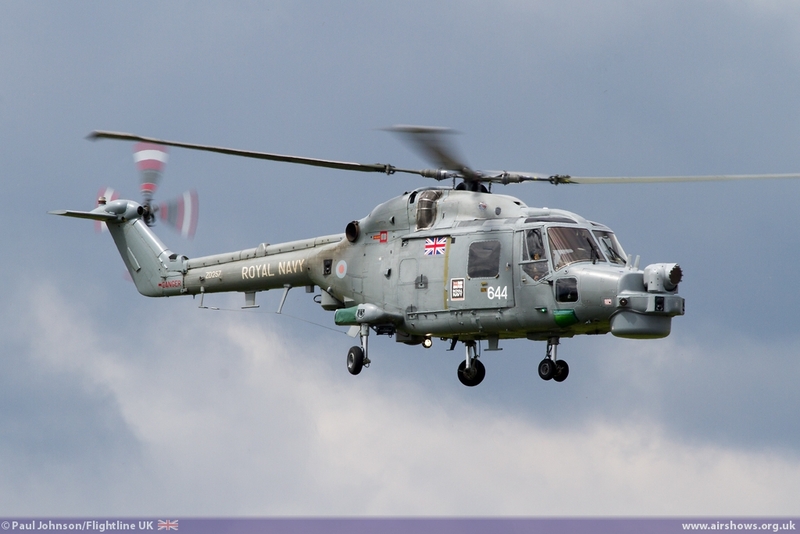 Flying opened with the Royal Navy and the Raiders Parachute Display Team jumping from the Westland Lynx HMA8 from the Black Cats Helicopter Display Team. 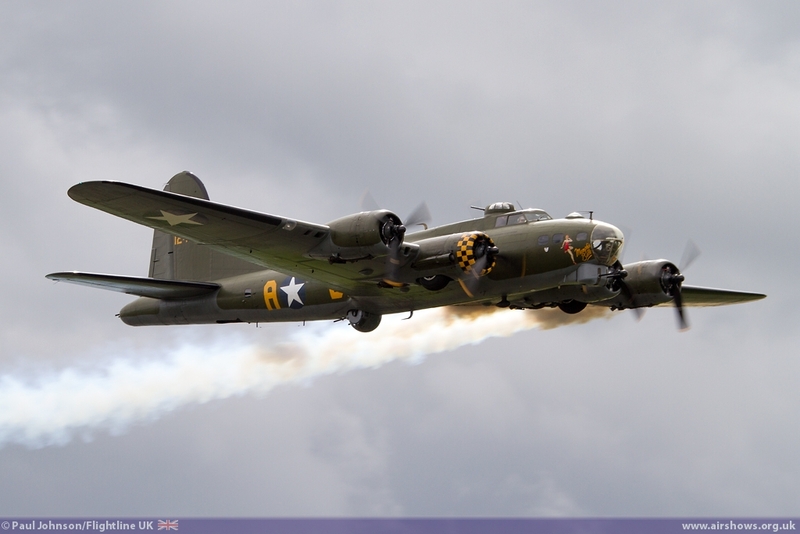 The Raiders are not often seen at airshows outside of Royal Navy airshows, so kudos to Biggin Hill from bringing in something different. 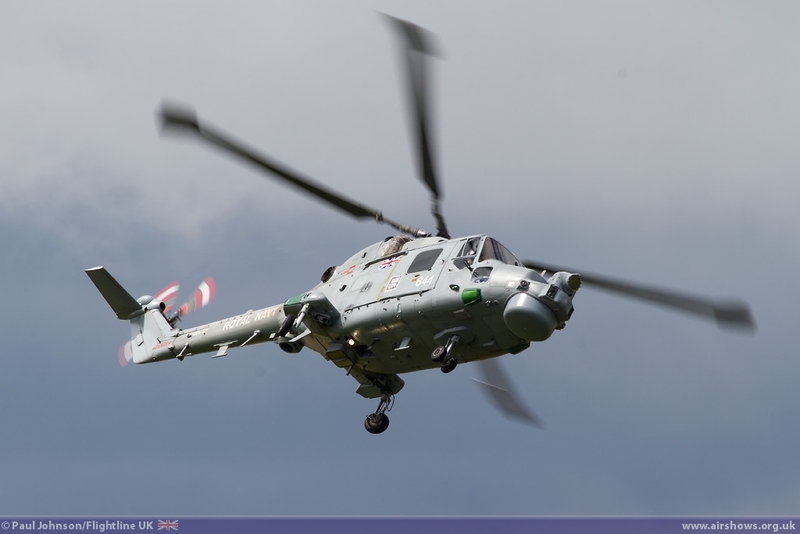 The solo Lynx HMA8 went to gove the first full aircraft display of the afternoon which showed off the helicopters superb agility both in the air and on the ground. 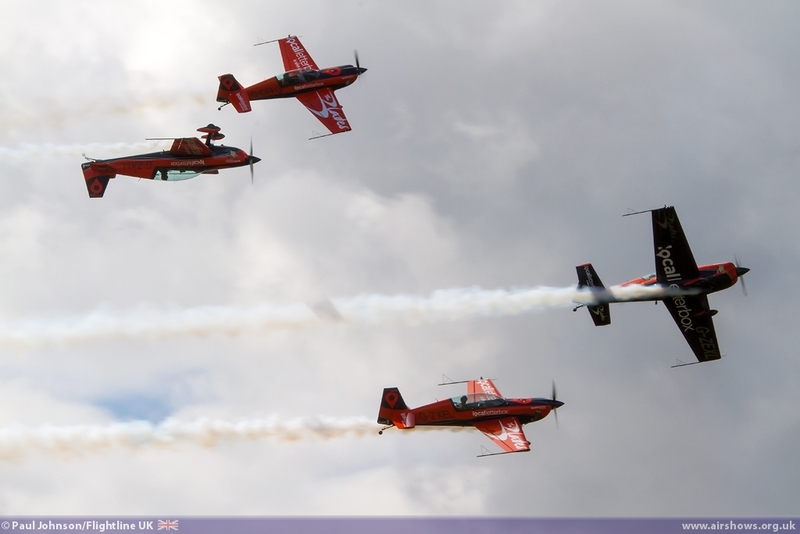 The afternoon saw a number of civilian aerobatic display team in the flying display throughout the afternoon. 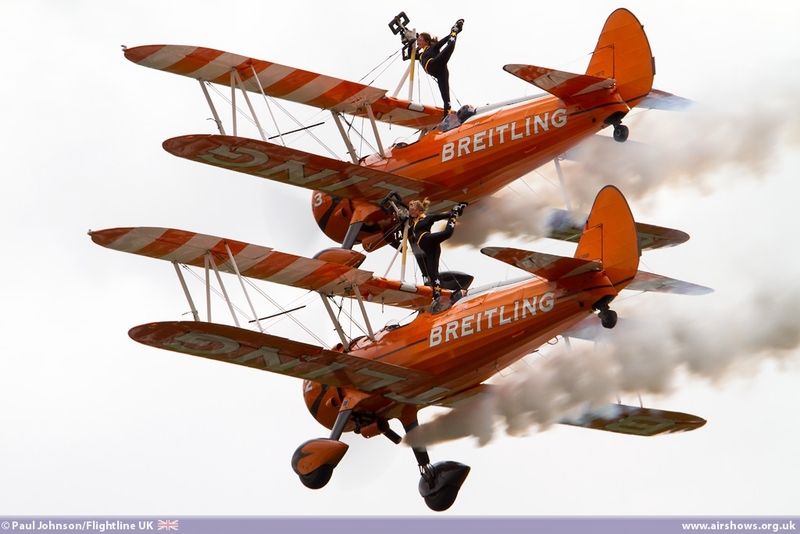 First to appear were the Breitling WIngwalkers. 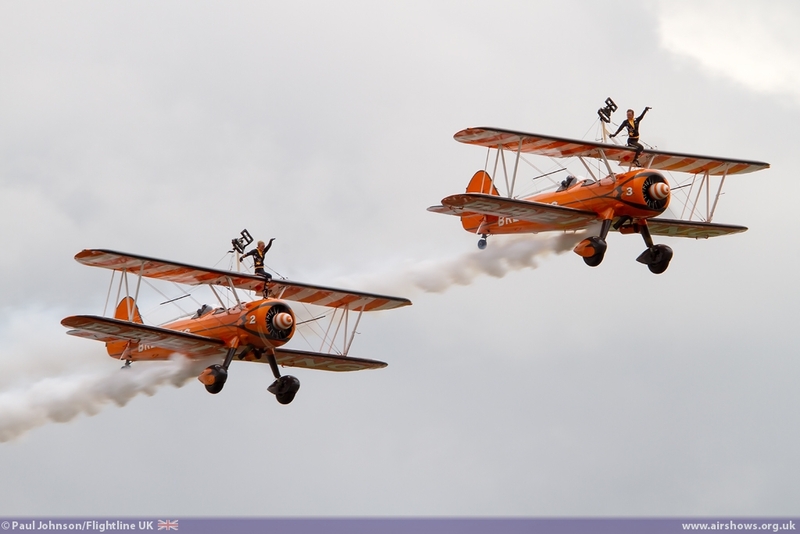 AeroSuperBatics and in particular their wingwalking formation team have a long association with Biggin Hill and its airshows. 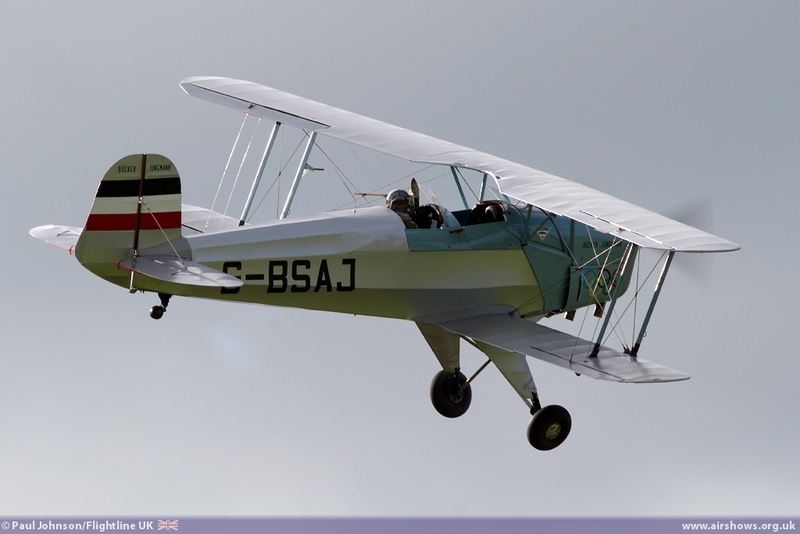 Biggin Hill marked one of the first displays for Lydia Beadle who has just joined the team for her first season as a full-time wingwalker. The team are always a crowd pleaser, certainly with the very enthusiastic commentary from Brendan O'Brien! 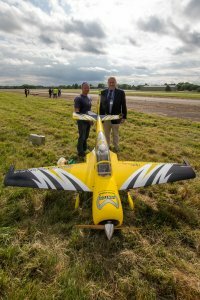 The GliderFX Display Team led by Guy Westgate were always a feature of the latter Air Fairs so it was good to see them back for the Festival of Flight. 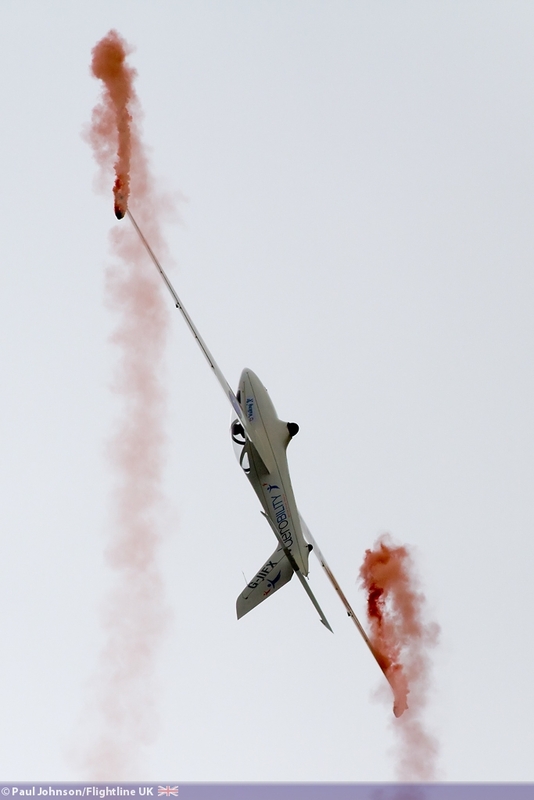 The team presented their unique low level aerotow display complete with “screamer” pyrotechnics before climbing to the cloud base and releasing the glider into it solo aerobatic routine. 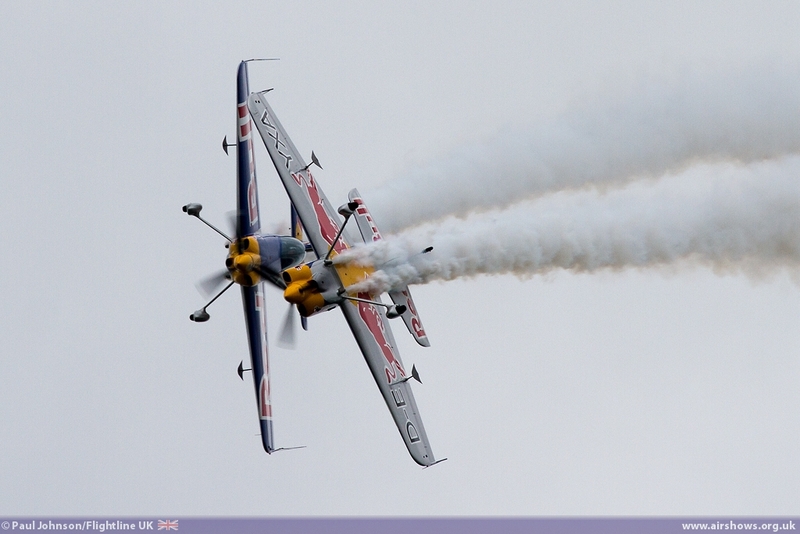 The aerobatic theme continued with the remaining teams. 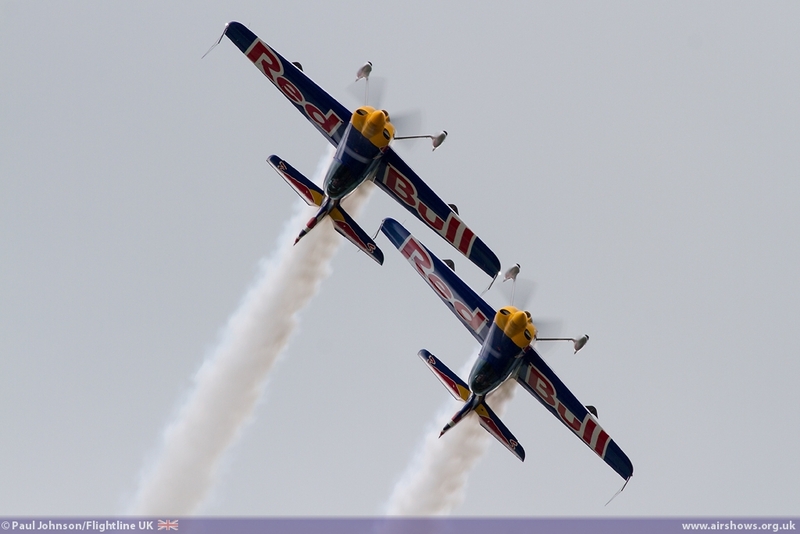 The Red Bull Matadors flying Xtreme Air XA41s never fail to enthralled with their impossibly close formation and incredible solo aerobatics. 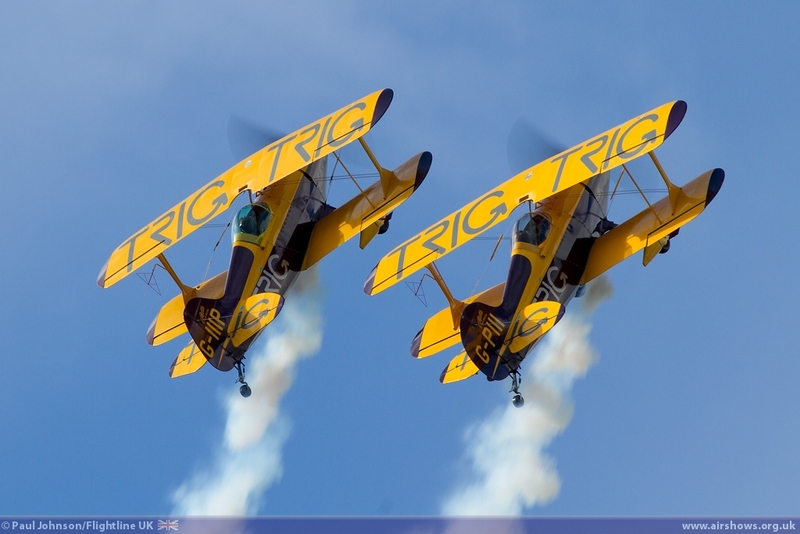 The show also saw the TRIG Aerobatic Team with their more classic Pitts S-1D Specials with their eye-catching fast paced routine. 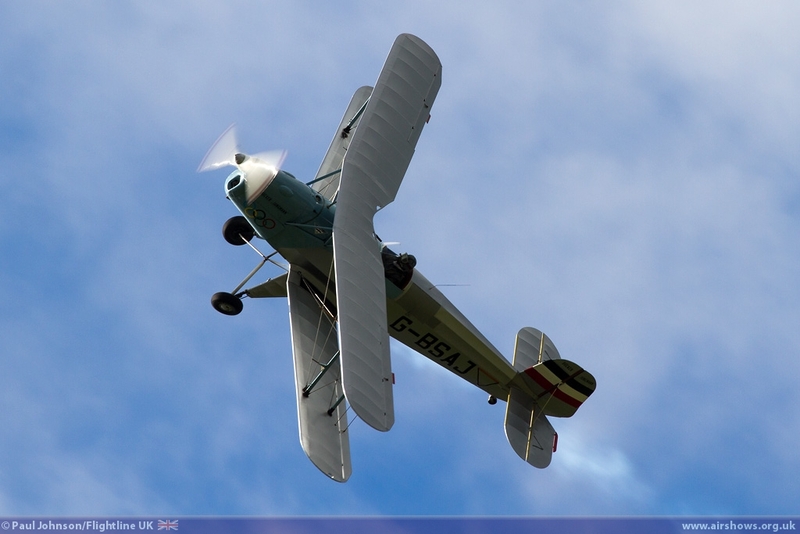 Solo aerobatics came from Anna Walker flying her beautiful Bucker Jungmann set against the late afternoon sunshine. 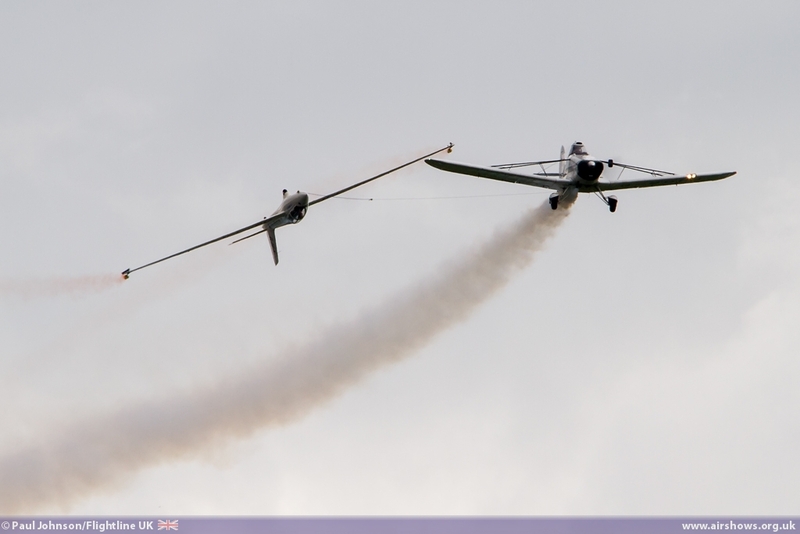 Biggest civilian team of the afternoon were The Blades flying their four Extra 300LP aircraft. 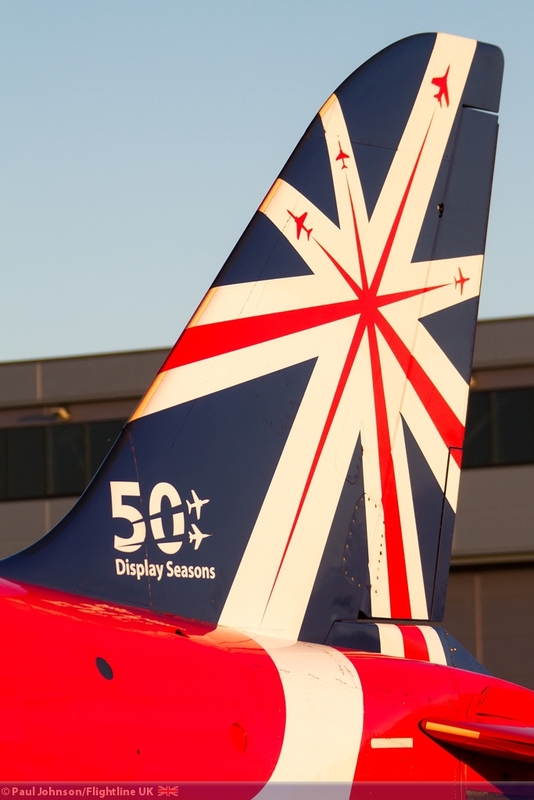 With the celebrations of the Red Arrows 50th Display Season, the Blades were a very apt addition as all team pilots are former members of the Reds. 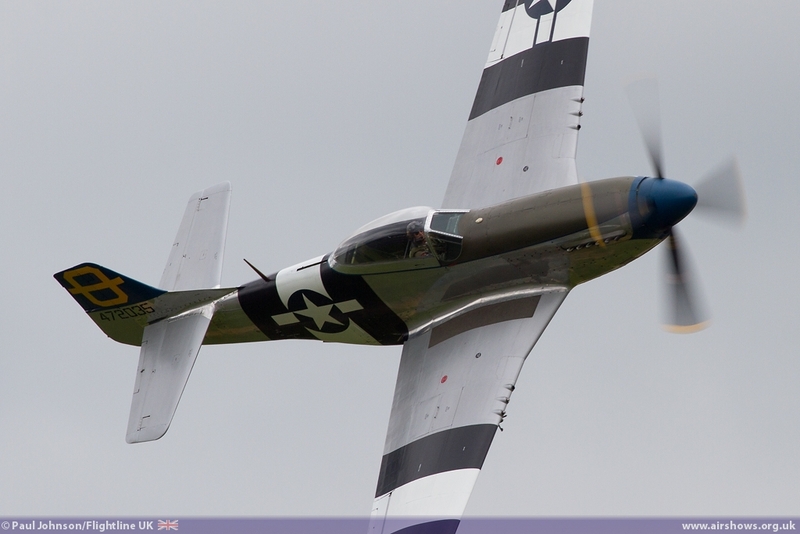 Warbirds were also well represented in the flying display. 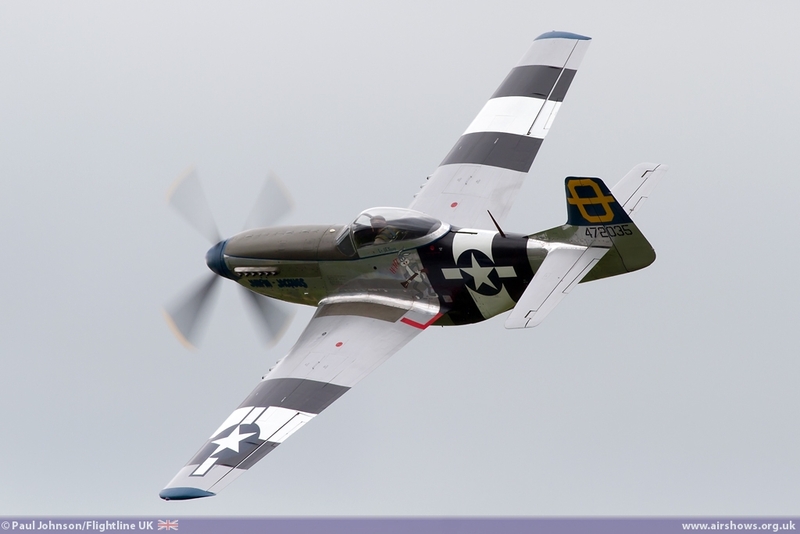 Peter Teichman flew his North American P-51D Mustang “Jumpin' Jacques” to open the heritage flying for the afternoon. 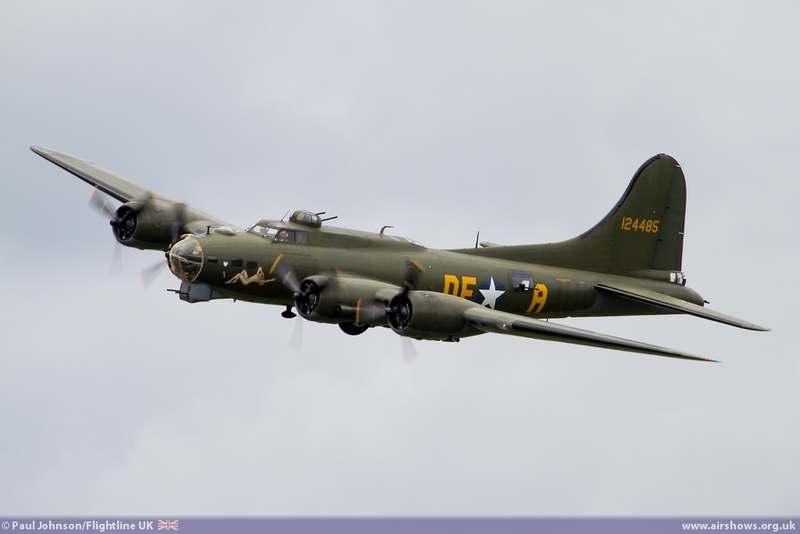 Further American heavy metal came in the form of Boeing B-17G Flying Fortress Sally-B, so often a feature of the Biggin Hill airshows. 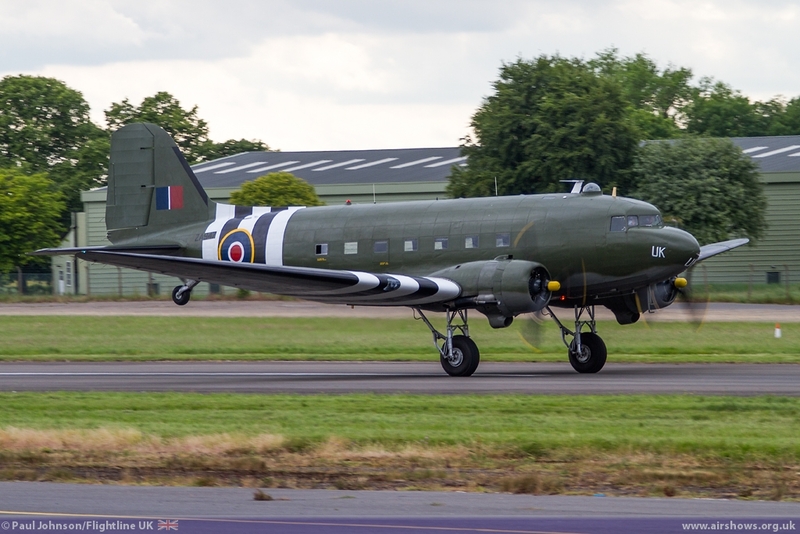 It was good to see Sally-B on the ground too rather than simply appearing in the air. 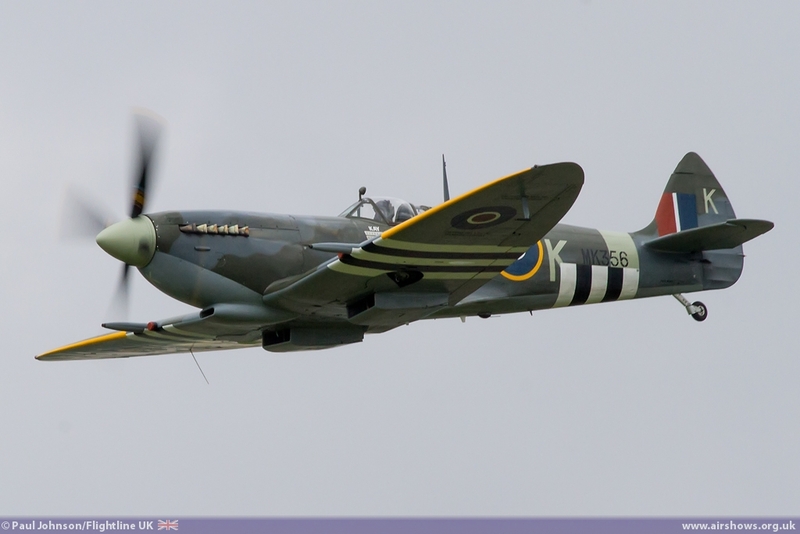 The Battle of Britain Memorial Flight featured well throughout the day. Early arrivals were treated to the departure of the flight's Avro Lancaster B1 to join the Queen's Birthday Flypast over London. 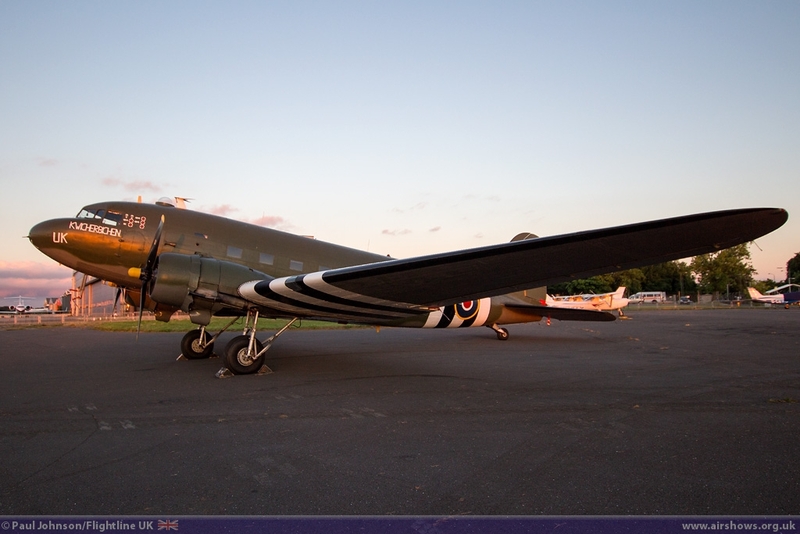 The Lancaster was at Biggin after an enforced stay in Caen to hydraulic problems after the D-Day Celebrations in Normandy. 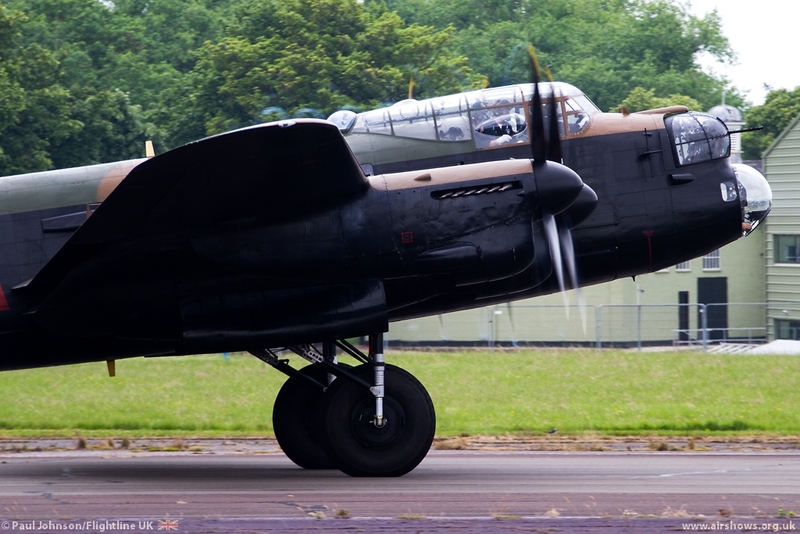 The hardworking BBMF ground crew got the aircraft airworthy for the flypast just in time and the Lancaster arrived on the Friday afternoon before in preparation for the flypast. 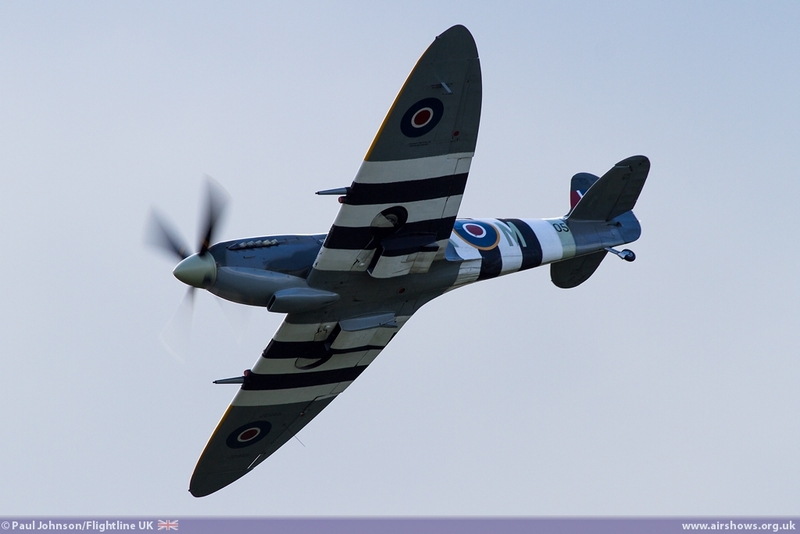 The official Festival of Flight participants were the Douglas Dakota III, Supermarine Spitfire XVI and Supermarine Spitfire IX from the flight, all decked out in their 1944 invasion strip markings. 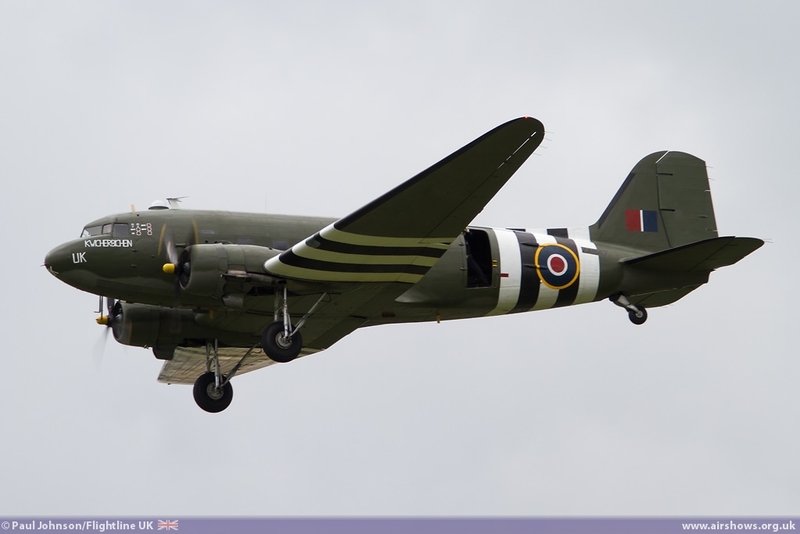 The Dakota arrived early in the day following its own part in the Birthday flypast. 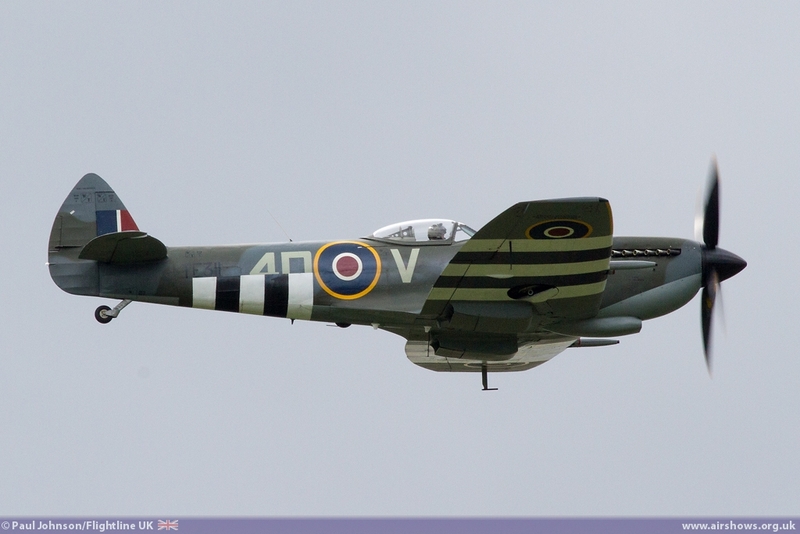 Following its solo display, the pair of Spitfires arrived performing the “Synchro Pair” routine which was a welcome change from the usual fighter solos. 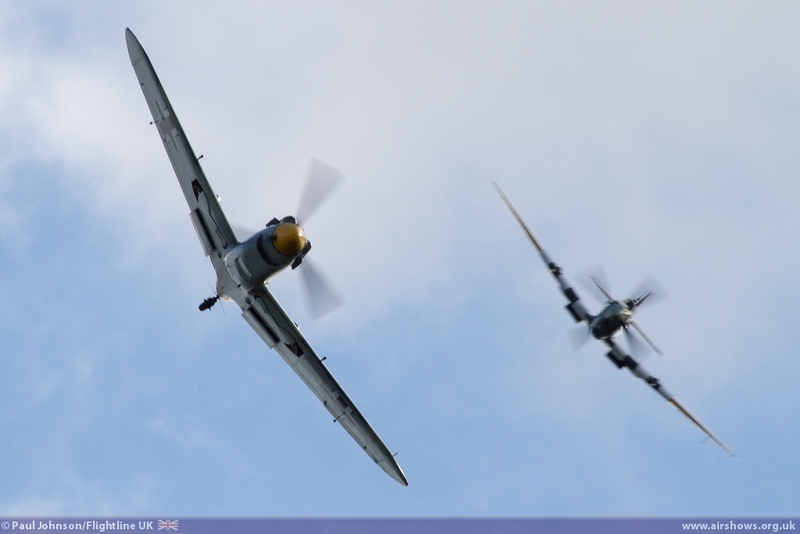 With Biggin's Battle of Britain Heritage, it was great to see a dogfight re-enactment. 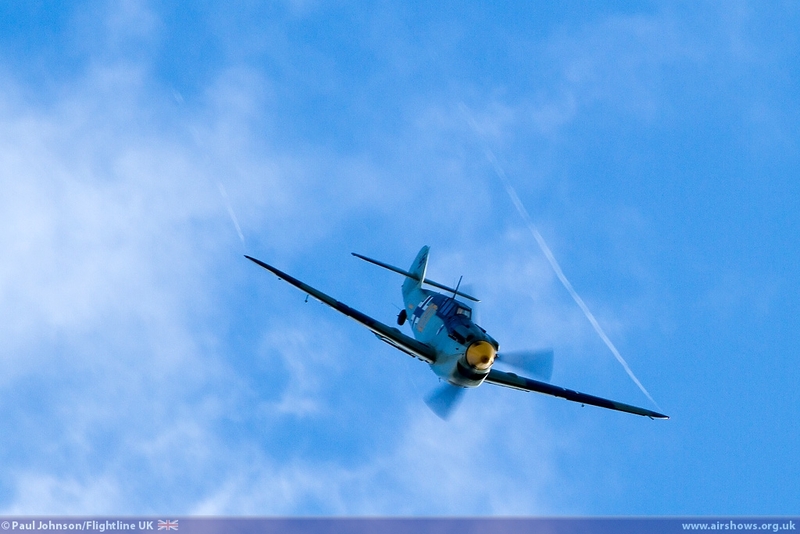 ARCo's Hispano HA112-M1L Buchon played the role of a stalking Me109 attacking the airfield. 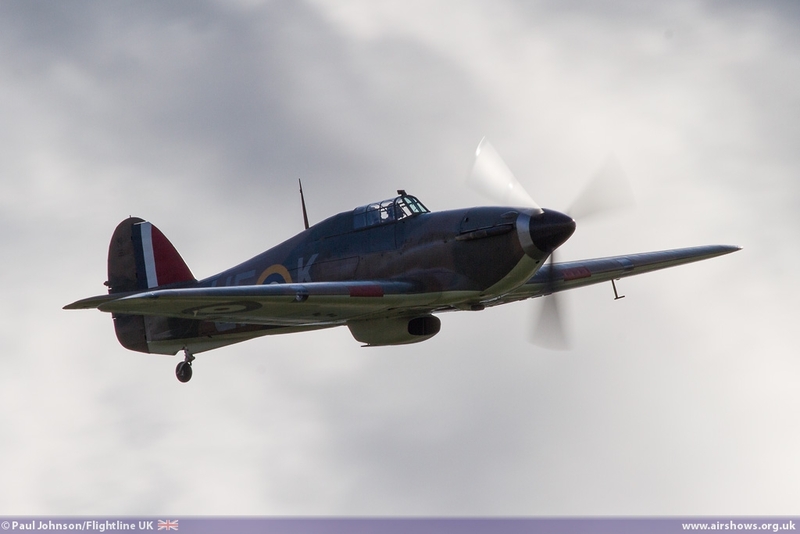 First to scramble was the Biggin Hill Heritage Hangar's Hawker Hurricane X in the hands of Cliev Denney. 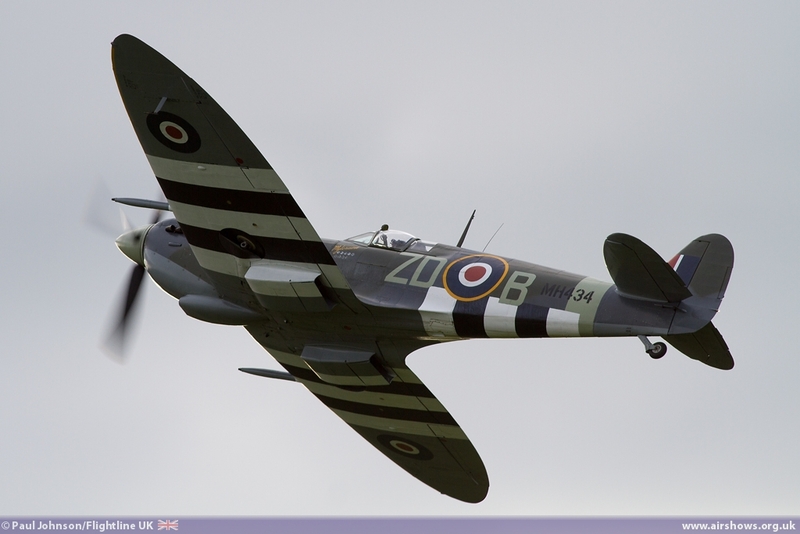 Following on shortly afterwards was Dan Griffith in Spitfire IX TA805 “The Spirit of Kent” demonstrating a full Battle climb to try and get an advantage over the Buchon before entering a tight turning dogfight! 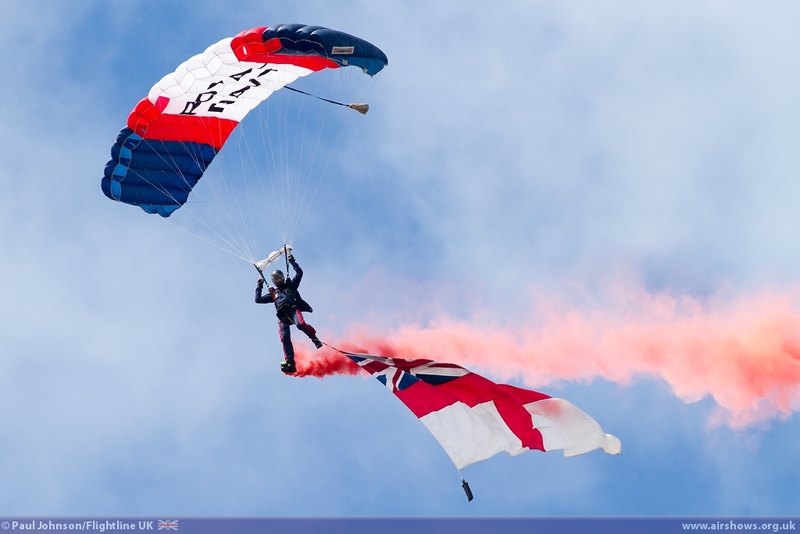 The closing segment of the flying displays was led by the Royal Air Force. 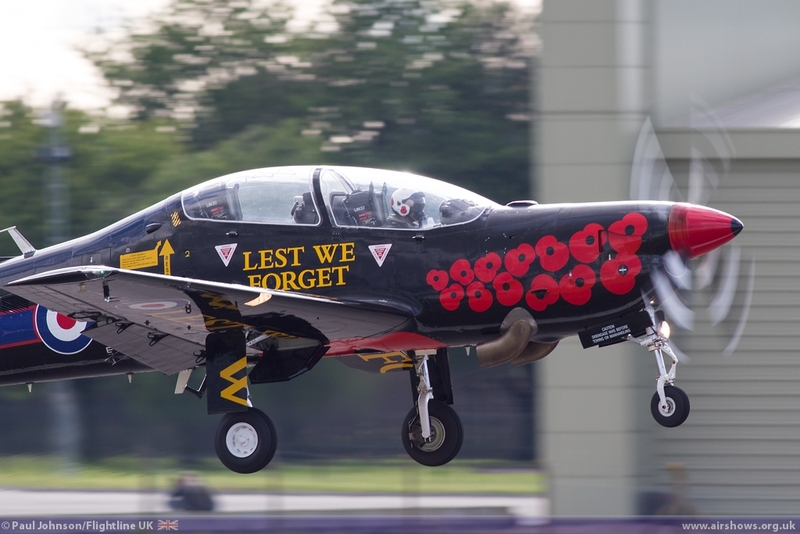 It was opened by the Shorts Tucano T1 flown by Flt Lt Dave Kirby through an elegant routine of low level aerobatics. 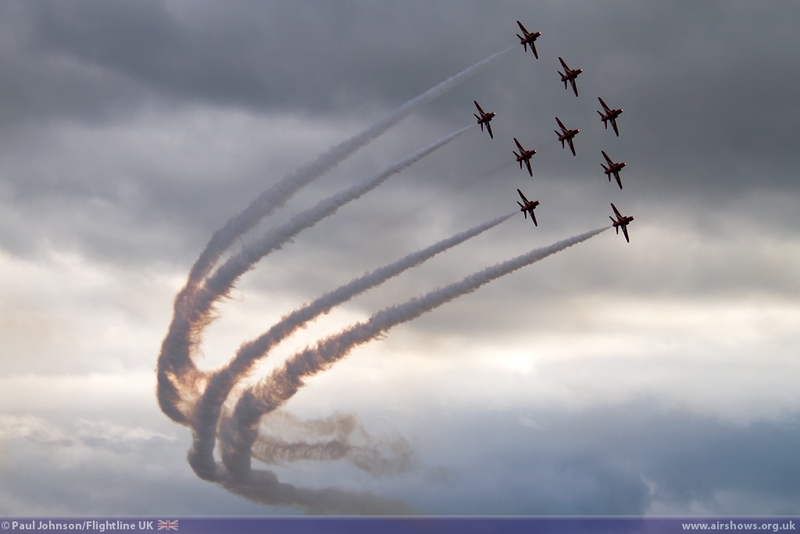 However the highlight was the display by the Red Arrows. 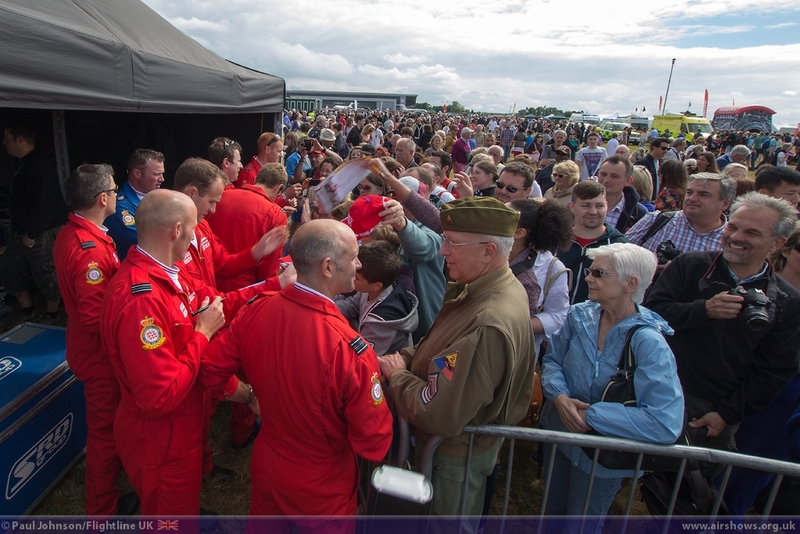 The crowd were thoroughly engrossed by the team's rolling display, particularly as Red 10, Sqn Ldr Mike Ling grew up in Biggin Hill and was inspired to join the Royal Air Force through attending the Biggin Hill Air Fair. 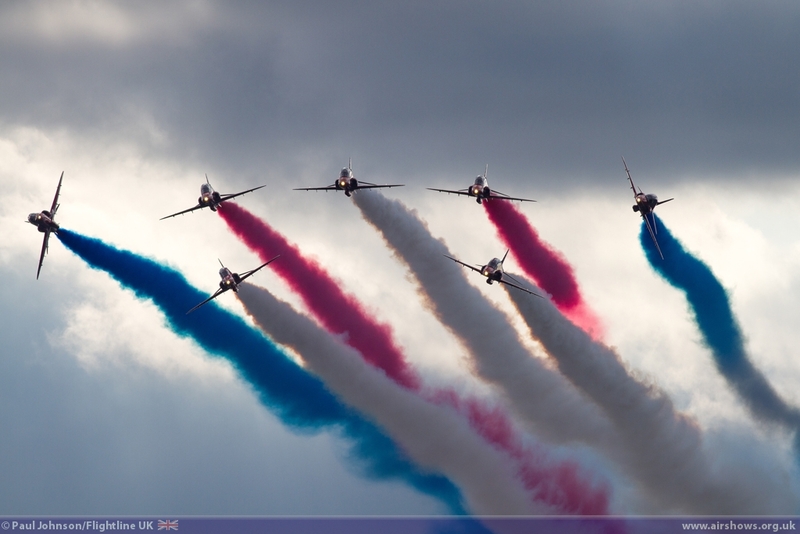 However, things were about to get even better. 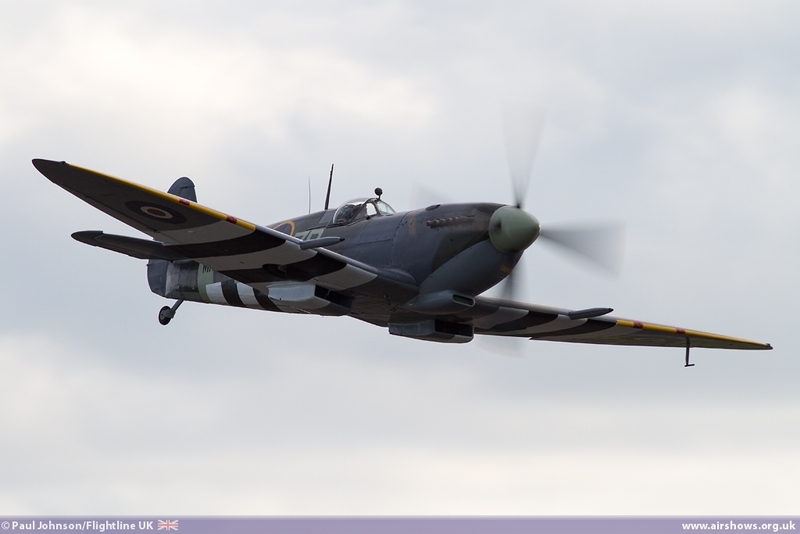 As the team closed their display, OFMC's Spitfire IX MH434 got airborne in the hands of Paul Bonhomme and headed out to the north. 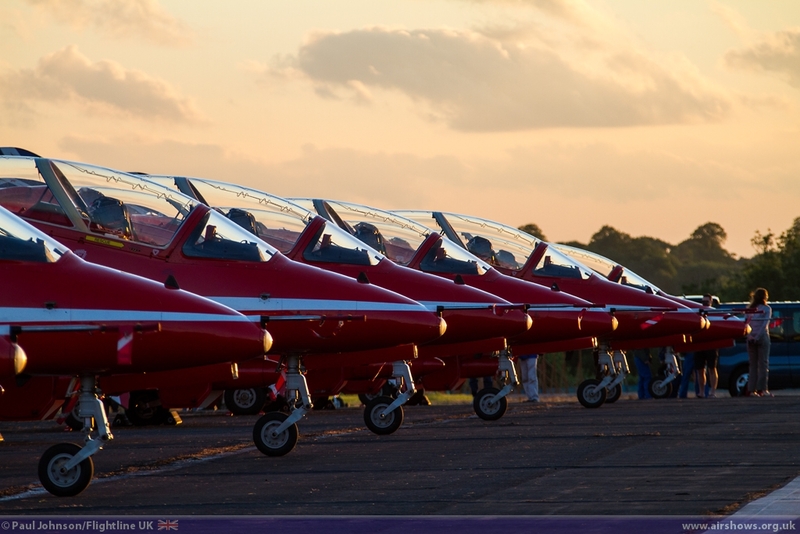 A few minutes late, the Red Arrows re-appeared from the south with MH434 tucked close in behind the Hawks in Big Battle Formation. 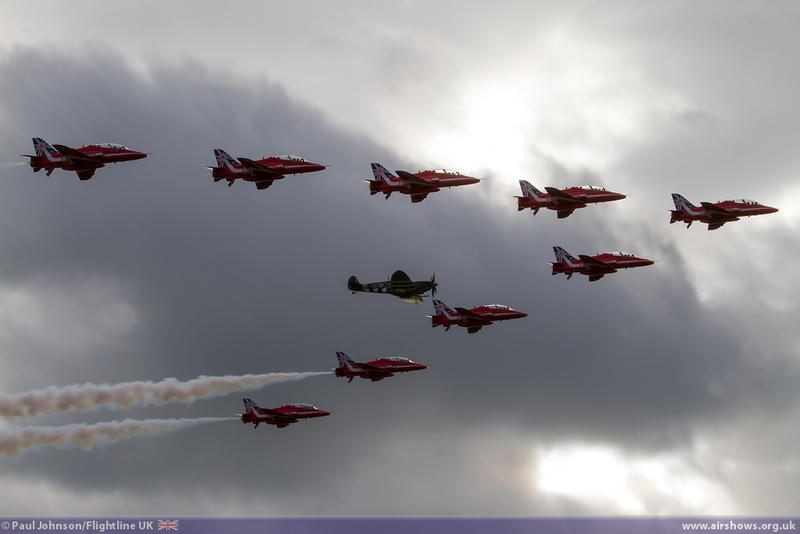 It was truly an emotional moment for Biggin Hill. 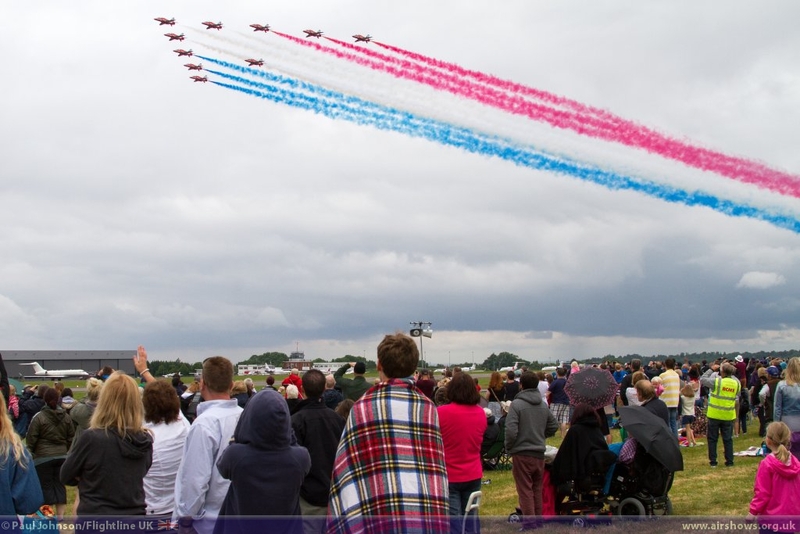 Not only was it a fine tribute to the Red Arrows 50th Display Season, but MH434 was often flown by Ray Hanna to close the show and of course Ray lead the team for four display seasons from 1966-1969 so it was a formation that meant a great deal to many people around Biggin Hill. 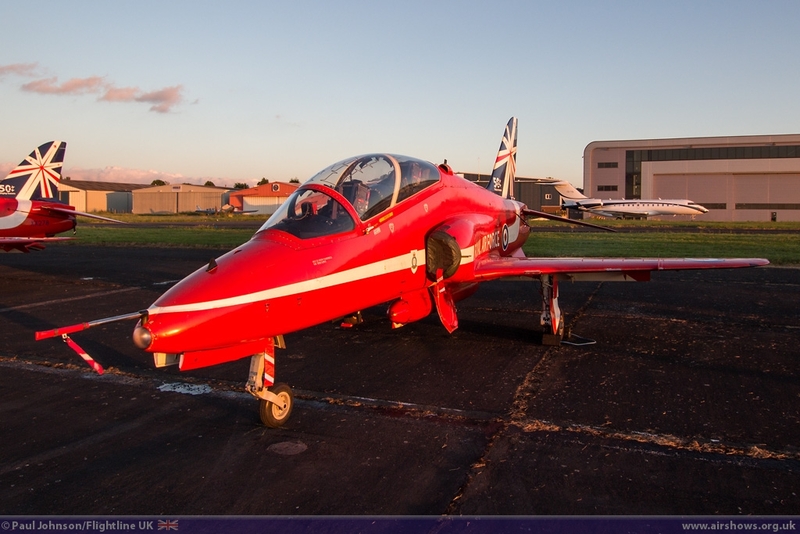 The show was of course closed by a solo display by Paul in MH434 set to Willian Blake's Jerusalem against the most impressive cloudscape over the old RAF camp – as always the most fitting finale to a display at Biggin! 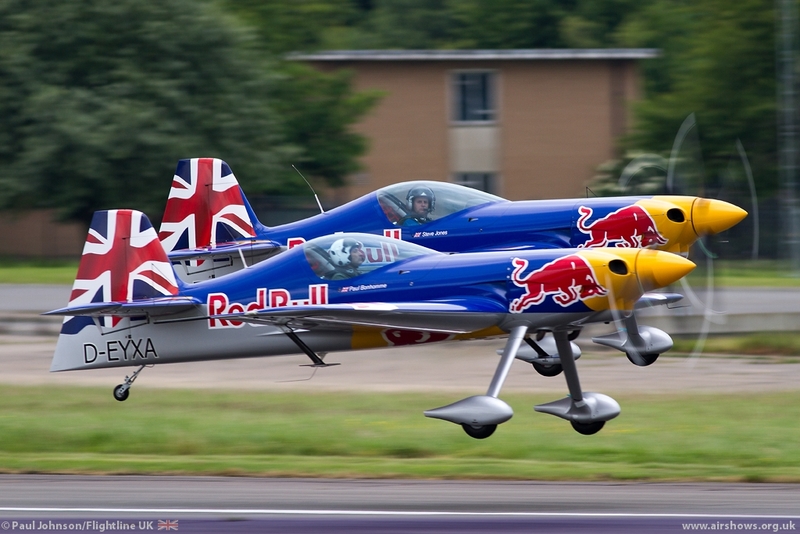 The Festival of Flight was certainly marked an exciting return of airshows to Biggin Hill. The new format was certainly one that worked surprisingly well creating a great relaxed family afternoon out. As always, being a new event brought about some teething issues, not least the traffic queues trying to exit the event which lasted too long. 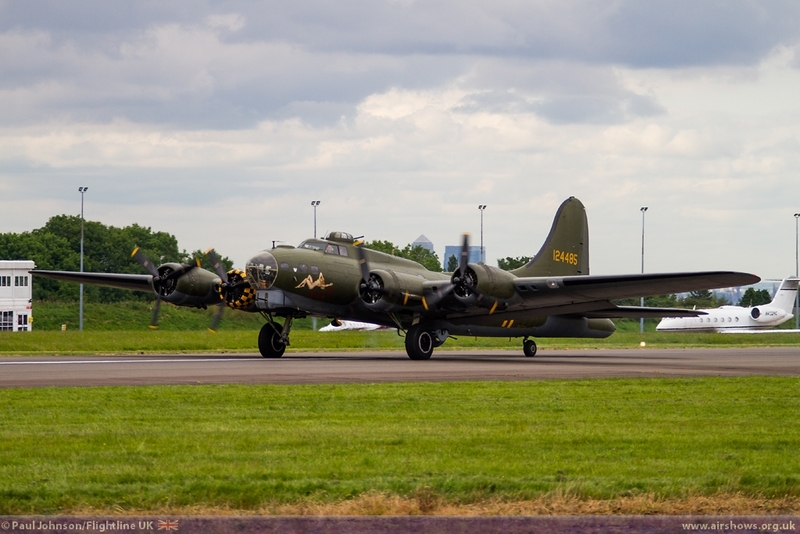 However, going by the comments on the event's facebook and twitter feeds it seems that many people agree this was a great start to a new event, and certainly one we all want to see back in 2015!